Vladimir Yakovlevich Propp (Russian: Владимир Яковлевич Пропп; 29 April [O.S. 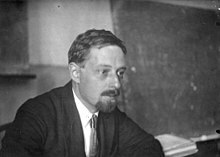 17 April] 1895 – 22 August 1970) was a Soviet formalist scholar who analyzed the basic plot components of Russian folk tales to identify their simplest irreducible narrative elements. Vladimir Propp was born on April 17, 1895 in St. Petersburg to a German family. He attended St. Petersburg University (1913–1918) majoring in Russian and German philology. Upon graduation he taught Russian and German at a secondary school and then became a college teacher of German. His Morphology of the Folktale was published in Russian in 1928. Although it represented a breakthrough in both folkloristics and morphology and influenced Claude Lévi-Strauss and Roland Barthes, it was generally unnoticed in the West until it was translated in 1958. His character types are used in media education and can be applied to almost any story, be it in literature, theatre, film, television series, games, etc. In 1932, Propp became a member of Leningrad University (formerly St. Petersburg University) faculty. After 1938, he shifted the focus of his research from linguistics to folklore. He chaired the Department of Folklore until it became part of the Department of Russian Literature. Propp remained a faculty member until his death in 1970. Vladimir Propp broke up fairy tales into sections. Through these sections he was able to define the tale into a series of sequences that occurred within the Russian fairytale. Usually there is an initial situation, after which the tale usually takes the following 31 functions. Vladimir Propp used this method to decipher Russian folklore and fairy tales. First of all, there seem to be at least two distinct types of structural analysis in folklore. One is the type of which Propp's Morphology is the exemplar par excellence. In this type, the structure or formal organization of a folkloristic text is described following the chronological order of the linear sequence of elements in the text as reported from an informant. Thus if a tale consists of elements A to Z, the structure of the tale is delineated in terms of this same sequence. Following Lévi-Strauss (1964: 312), this linear sequential structural analysis we might term "syntagmatic" structural analysis, borrowing from the notion of syntax in the study of language (cf. Greimas 1966a:404). The other type of structural analysis in folklore seeks to describe the pattern (usually based upon an a priori binary principle of opposition) which allegedly underlies the folkloristic text. This pattern is not the same as the sequential structure at all. Rather the elements are taken out of the "given" order and are regrouped in one or more analytic schemas. Patterns or organization in this second type of structural analysis might be termed "paradigmatic" (cf. Sebag 1963:75), borrowing from the notion of paradigms in the study of language. Respectively equivalent to syntagmatic and paradigmatic are the terms "diachronic" and "synchronic." Diachronic is the analysis that gives the reader a sense of "going through" the highs and lows of a story, much like the pattern of a sine wave. The second term, synchronic, is where the story is taken in all at one time, like in the pattern of a circle. Most literary analyses are synchronic, offering a greater sense of unity among the components of a story. Although both structural analyses convey partial information about the story, each angle of analysis delivers a different set of information. 1. ABSENTATION: A member of a family leaves the security of the home environment. This may be the hero or some other member of the family that the hero will later need to rescue. This division of the cohesive family injects initial tension into the storyline. The hero may also be introduced here, often being shown as an ordinary person. 2. INTERDICTION: An interdiction is addressed to the hero ('don't go there', 'don't do this'). The hero is warned against some action (given an 'interdiction'). 3. VIOLATION of INTERDICTION. The interdiction is violated (villain enters the tale). This generally proves to be a bad move and the villain enters the story, although not necessarily confronting the hero. Perhaps they are just a lurking presence or perhaps they attack the family whilst the hero is away. m questions the villain). The villain (often in disguise) makes an active attempt at seeking information, for example searching for something valuable or trying to actively capture someone. They may speak with a member of the family who innocently divulges information. They may also seek to meet the hero, perhaps knowing already the hero is special in some way. 5 DELIVERY: The villain gains information about the victim. The villain's seeking now pays off and he or she now acquires some form of information, often about the hero or victim. Other information can be gained, for example about a map or treasure location. 6. TRICKERY: The villain attempts to deceive the victim to take possession of victim or victim's belongings (trickery; villain disguised, tries to win confidence of victim). The villain now presses further, often using the information gained in seeking to deceive the hero or victim in some way, perhaps appearing in disguise. This may include capture of the victim, getting the hero to give the villain something or persuading them that the villain is actually a friend and thereby gaining collaboration. 7. COMPLICITY: Victim taken in by deception, unwittingly helping the enemy. The trickery of the villain now works and the hero or victim naively acts in a way that helps the villain. This may range from providing the villain with something (perhaps a map or magical weapon) to actively working against good people (perhaps the villain has persuaded the hero that these other people are actually bad). 8.VILLAINY or LACK: Villain causes harm/injury to family member (by abduction, theft of magical agent, spoiling crops, plunders in other forms, causes a disappearance, expels someone, casts spell on someone, substitutes child etc., commits murder, imprisons/detains someone, threatens forced marriage, provides nightly torments); Alternatively, a member of family lacks something or desires something (magical potion etc.). There are two options for this function, either or both of which may appear in the story. In the first option, the villain causes some kind of harm, for example carrying away a victim or the desired magical object (which must be then be retrieved). In the second option, a sense of lack is identified, for example in the hero's family or within a community, whereby something is identified as lost or something becomes desirable for some reason, for example a magical object that will save people in some way. 9.MEDIATION: Misfortune or lack is made known, (hero is dispatched, hears call for help etc./ alternative is that victimized hero is sent away, freed from imprisonment). The hero now discovers the act of villainy or lack, perhaps finding their family or community devastated or caught up in a state of anguish and woe. 10.BEGINNING COUNTER-ACTION: Seeker agrees to, or decides upon counter-action. The hero now decides to act in a way that will resolve the lack, for example finding a needed magical item, rescuing those who are captured or otherwise defeating the villain. This is a defining moment for the hero as this is the decision that sets the course of future actions and by which a previously ordinary person takes on the mantle of heroism. 31WEDDING: Hero marries and ascends the throne (is rewarded/promoted). Occasionally, some of these functions are inverted, as when the hero receives something whilst still at home, the function of a donor occurring early. More often, a function is negated twice, so that it must be repeated three times in Western cultures. The villain — struggles against the hero. The dispatcher — character who makes the lack known and sends the hero off. The (magical) helper — helps the hero in their quest. The princess or prize and her father — the hero deserves her throughout the story but is unable to marry her because of an unfair evil, usually because of the villain. The hero's journey is often ended when he marries the princess, thereby beating the villain. The donor — prepares the hero or gives the hero some magical object. The hero or victim/seeker hero — reacts to the donor, weds the princess. The false hero — takes credit for the hero’s actions or tries to marry the princess. A man of Creativity !